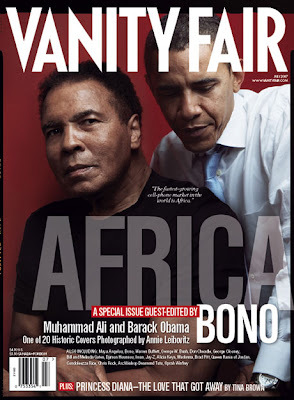 Bono and Vanity Fair editor in chief Graydon Carter clearly are thinking big when it comes to the magazine's Africa-themed July issue, which is being guest edited by the rock star-philanthropist. 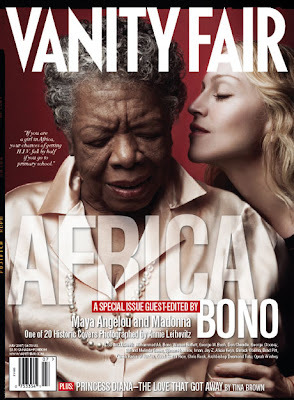 The title will publish 20 different covers, all shot by Annie Leibovitz. The covers will reflect Arica and it's supporters, including: Oprah Winfrey, Bill and Melinda Gates, Brad Pitt, Barack Obama, and Muhammad Ali. I love this idea and am tempted to purchase all 20 covers. This leads me to say, I do believe that we can create change. Let's support and cherish each other, after that, all good things will come. Madonna's looking great! And I love Annie Leibovitz' work. Thanks for sharing this great cover!